Home / Columnists/ Yes, we Khan! Imran Khan’s victory in the Pakistani elections is of enormous and positive significance for all of us in South Asia. His win is of course in keeping with the global trend of the triumph of populism over the political establishment and old political parties being eclipsed by relatively new ones or ‘third force’ parties. Imran is usually described as ‘populist’, while his party the PTI is classified as ‘centrist’ and his own personal views on issues of religion are defined as ‘liberal’. That is a welcome combination that we have yet to see in contemporary Sri Lanka. Sri Lankan politics and politicians as well as aspirant political leaders, from the Opposition and the Government, have much to learn from Imran Khan. If they want to know how to win given the global Zeitgeist, they must know which policies and profile to adopt and which are bound to fail. In this sense, Imran Khan provides an example for politicians throughout South Asia—an example of what wins elections and which kind of leader the people turn to in these troubled times. While Imran Khan will be a first-time Prime Minister, and he was known to an earlier generation as a star of world cricket, he is in no sense a novice to politics and social issues. Holder of an honors degree in Politics, Philosophy and Economics from Oxford, Imran retired from cricket, put into practice his concern for the poor by starting a cancer hospital in which 70% of the patients were poor and treated for free. He went on to build a second and follow it up with a university, both of which gave weightage to the poor. After building the cancer hospital, Imran went on to form his political party the PTI in 1996, which has finally won “after 22 years of struggle” as Imran said. He was twice elected to Pakistan’s Parliament. In a long televised address claiming victory, Imran rolled out his policies and made solemn promises to the Pakistani people. What struck me was the stark difference between his discourse and those of Sri Lankan politicians and political aspirants today. His speech which was spontaneously delivered, with only a single sheet of paper on his table which he didn’t look at except before the speech began, had two components, national and international. As the BBC commented immediately after, the heavy emphasis was on Human Development and the social issues facing Pakistan; the poor and the weak and their upliftment through poverty alleviation, social welfare, health, education. He went on to speak about the labourers and the farmers, “who cannot give proper food to their children”, the “children who are out of school…children who fall sick by drinking dirty water”, the unemployed, the disabled, the minorities, women and even the domestic workers “without rights”. He said he will not enact policies which primarily benefit a “small elite”. No country which has an island of the rich among a sea of poor, is a successful country, he stressed. How many political figures in South Asia or Sri Lanka speak, think or feel this way? Here the local ‘Clintonian’ neoliberals speak of global markets while the local ‘Trumpian’ neoconservatives speak of race and religion—but neither prioritize the people and their identifiable needs. Imran’s extensive references to China were quite different from those that are made in Sri Lanka, where they are a monumental misunderstanding of the Chinese experience and interpreted primarily as a path to rapid growth, through managerial and technological quick fixes and the rule of the professionals. There was none of this distortion in Imran Khan’s understanding of the lessons of China. In his very first sentence on the subject he said: “We want to learn from China how they brought 700 million people out of poverty ...” we must learn from China’s experience in poverty alleviation”. He went on to mention poverty in his references to India, saying that the alleviation of poverty must be the number one priority of any government in south Asia and it is in order to facilitate the achievement of this goal that we need cooperation within South Asia, especially cooperation between Pakistan and India. The foreign policy component of Imran’s victory speech was of particular interest because it was departure from the views usually expressed in the subcontinent which happen to be US-centric or Indo-centric. Imran’s remarks were multi-sectoral, arguably even multi-tiered. His opening mention was of the relationship with China. He went to neighboring Afghanistan, saying that he hoped for an open border arrangement someday, such as that which prevails in Europe. His next reference was to Iran, followed by Saudi Arabia and the Middle-East region. He then moved to the two trickiest of relationships, namely the USA and India. Imran Khan had been a longstanding opponent of the US drone war in the Af-Pak theatre. In his speech he said that Pakistan should not fight America’s wars. Obviously the relationship with the US was not his first priority and had been replaced by that with China and the ‘larger Middle East’ as it is known. In the matter of the relationship with India, Imran Khan struck a fine balance. He reminded the audience that as a cricketer he had traveled the length and breadth of India, and therefore he was saddened by the fact that the Indian media seemed to depict him as a “Bollywood bad guy”. He was unafraid to grasp the nettle of Kashmir, arguing that there could be no military solution to a problem with political roots. He concluded his foreign policy presentation by saying that India and Pakistan should move towards each other, pledging that if India were to take one step forward, then Pakistan under his leadership would take two steps forward toward friendship with India. 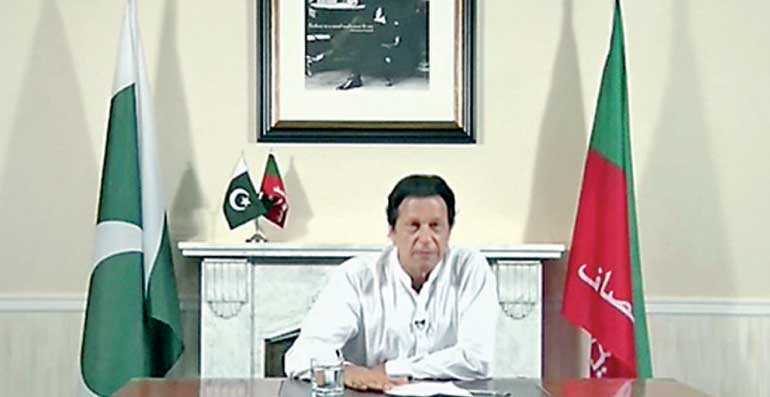 Imran Khan’s views on Afghanistan, Pakistan’s own Baluchistan Province, Kashmir and the relationship with India, have a common philosophical thread running through it. While he opened his televised victory address with a strong denunciation of terrorist suicide bomb attacks and it is an open secret that he has enjoyed the support of Pakistan’s influential military especially during this election, having long cultivated its support, it is also the case that he strongly believes that political and ethnic problems at the root of insurgencies cannot be solved by military action and that even deploying the army to face political unrest which enjoys mass support, is counterproductive anywhere and everywhere in the world. South Asian politics had only one charismatic star in the firmament—Narendra Modi. Now it has two. Imran Khan has achieved in domestic politics that which he used to achieve on the cricket field. It is possible that he will go beyond the domestic arena and achieve for Pakistan in the global political arena that which he achieved for his country in the realm of Test cricket and by so doing he may contribute through his ideas and personality, substance and style, to South Asian politics as a whole, that which he did in the game of cricket, in his earlier avatar.